that allows us to transfer our photos from various image hosting services. Migratr will also migrate your metadata, including the titles, tags, descriptions and album organization. This freeware app photo management tool lets you upload and download photos between various online photo-sharing sites. 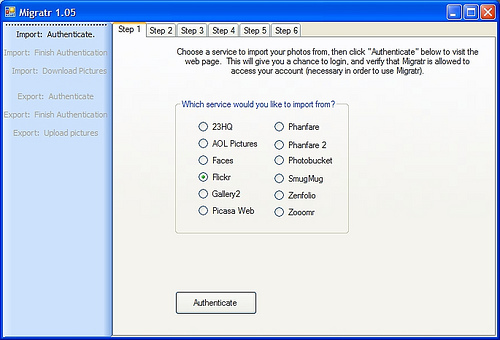 Among supported sites include: Flickr, 23HQ, SmugMug, Faces.com, PicasaWeb, Phanfare, Zenfolio, Gallery2, and Photobucket. Metadata is transferred along with the photos, including tags, title, description, and album organization. Posted in	Miscellaneous, Online software, Photo. Tagged with	"picasa to photobucket", transfer pictures from smugmug to flicker, transfer smugmug photos to facebook, transfer smugmug photos to flickr, transfer smugmug to photobucket, transfer smugmug to picasa, transfer smugmug to zenfolio, transfer smumug to picasaweb, transfering photobucket to my computer, transfering photos from smugmug to picassa, transfering picasa photos to my ipad, transfering pictures photobucket to facebook. John – we had no issue using it. It worked flawless every time. Anyway, the software is not made by us, we were merely reviewing it and make it available for download for our readers. you will find there the links to support forums and so on. It says this every time. I have tried installing and reinstalling the software but still getting the same error message. Waiting of course, doesn’t help either – the same message pops up regardless of what I do. I want to use this software to migrate albums from FB to PB – the logical choice for me – since FB supports my HTC HD2 WM smartphone much better than PB does. Anyway I can’t get the FB application to authenticate Migratr. Selecting the “authenticate” button does absolutely nothing on my PC. I have a working very fast Win7 64-bit PC – with no problems nor issues. Your software doesn’t appear to be working. Also going into FB – your software is not listed as an “App” to authenticate either.